i may have fallen off the wagon for a little long while but don’t fret, i am back just in time for fall and a perfect dinner pairing for the season. every. single. day. i ask myself “what should i make for dinner tonight?” like i’ve never cooked a day in my life. i have hundreds of dinners pinned, torn out of magazines and on my fridge but in reality, they are either too time consuming, too many ingredients or i’m just not in the mood. but once in awhile, i have an “aha!” moment (rarely). 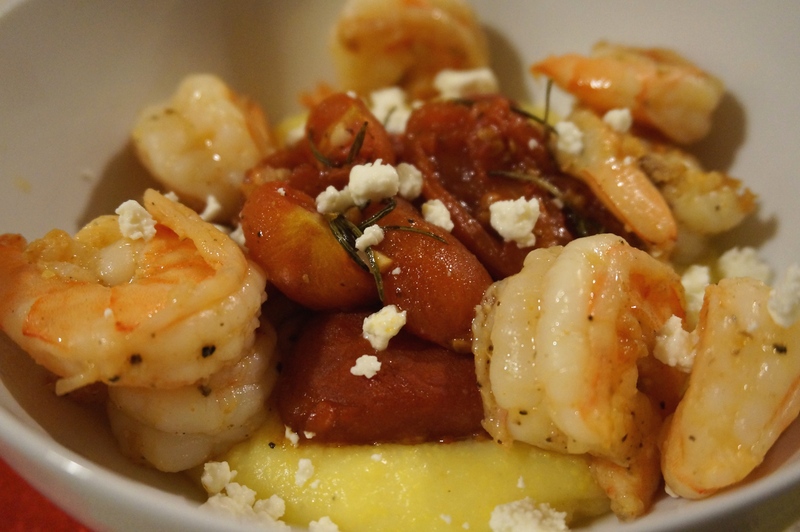 last night it was creamy polenta with roasted tomatoes and pan seared shrimpies. easy peasy, a foolproof weeknight dinner. shall we? 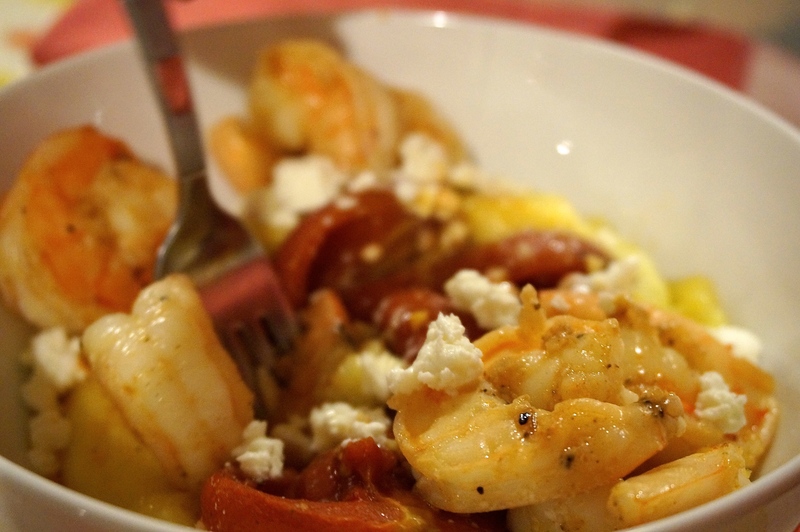 3/4 lb of shrimp (optional) plus seasonings – i used s+p, paprika, garlic and olive oil. if you bought shrimp, now would be the time to marinate. 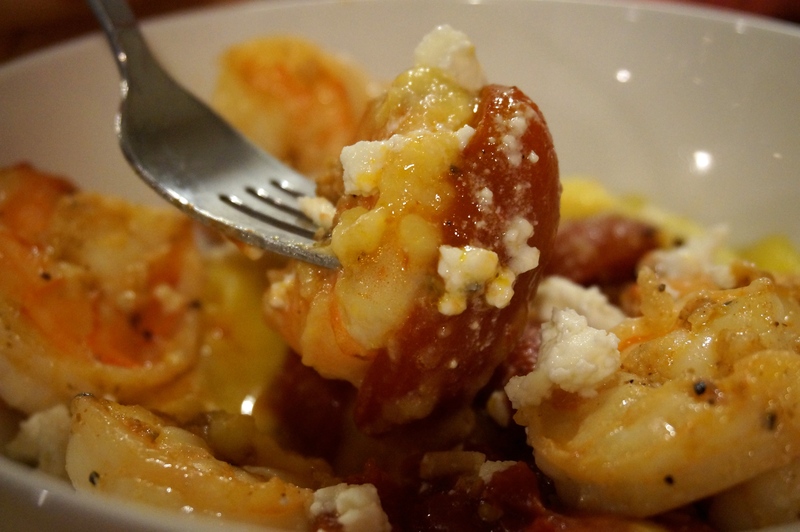 peel and devein your shrimp – if you are unsure of how, here’s a quickie little video. once you’ve finished, place in a bowl and pour over 1 tablespoon of olive oil, 2 cloves of minced garlic, 2 teaspoons of paprika plus some salt + pepper, per usual. place in fridge and let them become friends while preparing your other goodies. drain your tomatoes and cut them lengthwise in half then peel your garlic and roughly chop those babies up. add those two ingredients to a bowl and add 1 tablespoon of olive oil, salt, pepper + 4 spring of rosemary and toss. pour the mixture into a baking dish and throw em in the oven to get all juicy and tasty for 45 minutes, stirring 2-3 times throughout. onto the polenta….bring 6 cups of water to a boil. once it is boiling, add 1.5 cups of cornmeal in a steady stream while whisking to make sure it doesn’t get lumpy. continue to whisk 1-2 minutes until the polenta thickens. whisk in a few grinds of salt. turn it down to low and let it cook (and bubble) for 15 minutes. when the polenta has about 5 minutes left, heat up some olive oil in your shrimp pan (i prefer cast iron) and add shrimp. cook shrimp 2-3 minutes per side and voila. once polenta is done, turn off heat and add in your butter, milk, salt and pepper and whisk. to keep your polenta warm, cover it on up. if it gets too thick, add milk. by now your roasted tomatoes should be finished, take them out and serve over warm polenta and toss some shrimpies on there to finish. grate some cheese over it if you must, which, you pretty much must. TA-DA!